Almost 30 years ago there was outrage over a similar junket – as it was described – when Chief Minister Marshall Perron and his deputy, Barry Coulter, headed for Hong Kong and Shenzhen. 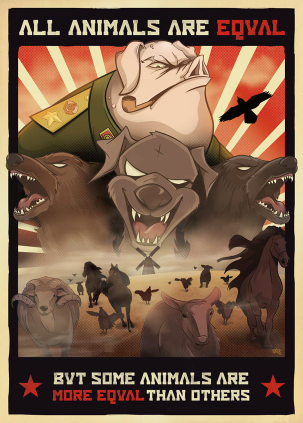 George Orwell’s allegorical novella Animal Farm. That was a CLP initiative which bore little fruit. Now Labor is doing the same. “The trip, which will include first-class accommodation, will be paid for by the Territory Government … it is estimated that about 65 people, including the public servants … they will be part of a 100-strong party working at the five-day, $1m promotion,” reported the Sunday Territorian on October 15, 1989. This time the NT Government tells us that the Mr Gunner and his group will “host the ‘Reaching South – to the Territory’ event in Shenzhen City, Guangdong Province [showcasing the NT] to business and industry representatives in Shenzhen and present a unique opportunity to connect with key business people and decision-makers in the region. Agribusiness, tourism, energy and minerals, education and training, tropical health and research, transport freight and logistics will be on the agenda. The Chief Minister was joined by Lauren Moss, Minister for Tourism and Culture, on August 29. According to her media release she will “promote [the] Territory as a unique and must do destination. The current delegation is treading a well worn path. Almost 30 years ago there was outrage when a large trade delegation from the NT was scheduled to travel to Hong Kong and Shenzhen, headed by Chief Minister Marshall Perron and his deputy (at right, in the day), and Barry Coulter (below left, contemporary). In mid-October 1989 the Sunday Territorian reported: “At least 40 Territory public servants will receive a week-long all-expenses paid trip to Hong Kong next month. “The trip, which will include first-class accommodation, will be paid for by the Territory Government. “Although details are yet to be finalized, it is estimated that about 65 people, including the public servants, will fly to the Hong Kong expo at the taxpayers’ expense. “They will be part of a 100-strong party working at the five-day, $1m promotion. “The size of the party being sent by the Government has sparked a political outcry. “As many as 30 Territory firms and organisations plus a range of Government and semi-government authorities will be represented in Hong Kong. “The expo … is a Government initiative aimed at attracting Hong Kong investment and business migration to the Territory. “About 20 of the public servants will continue on to the ‘free enterprise zone’ of Shenzhen in China for three more days of trade promotion work. “Both the Labor and National parties have attacked the level of Government spending at the expo. “The number of public servants attending has come in for particular criticism. But the Government has defended as necessary both the level of expenditure and the number of public servants attending,” said the newspaper report. “Mr Coulter’s spokesman predicted the Labor and National parties will be left with ‘egg on their faces’ over their criticism of the expo. The “passenger list for the Hong Kong expo” named all the government members and public servants expected to travel, including Perron, Coulter and Primary Industry and Fisheries Minister Mike Reed. The two NT trade delegations to Hong Kong / Shenzhen three decades apart bear striking similarities in numbers, purpose and length of time, right down to both respective Chief Ministers also being the Member for Fannie Bay – it’s just that Perron was CLP and Gunner is Labor. As a loyal card-carrying member of the CLP in 1989 I went in to bat in support of the trade delegation to Hong Kong with a letter to the editor published across the Territory. Clearly with the passage of time the delegation of that time did not lead to any significant advantage accruing to the Territory’s economy. Now here we go again, repeating history and – it would seem – re-inventing the wheel. Will the current Gunner-led delegation to China succeed where the previous attempt failed? Time will tell. However, isn’t it remarkable to note how the worm has turned, with Labor now doing virtually exactly the same exercise today over which it took the CLP to task all those years ago. I’m reminded of the final paragraph of George Orwell’s Animal Farm when the long-suffering farm animals peered through the dining room window of the farmhouse, observing the ruling pigs and a deputation of neighbouring farmers, once bitter enemies: “Twelve voices were shouting in anger, and they were all alike. Pity the Chinese, who have been studying and learning the English language, complete with grammar protocols, wondering how “boundless possible” could be used in a sentence, punctuated or taken seriously. If the I can see them laughing the first time those two words are used together. We may even find out the mandarin equivalent of WTF?